I've folded the wizard, but it's been a long while since then. I wasn't happy enough with the fold to post a picture here, though. Yeah, in the book, on Step 46-47 in the Ancient Dragon instructions, can you please help me and tell me what to do? I have no idea how to make the pleat thing. Please check http://snkhan.co.uk/... for several pages of advice on steps for the ancient dragon. Also, if you're experiencing problems early on in the diagrams (yeah, step 46 is early on), this model might still be too big a challenge for you right now. As to the step itself, it should be fairly straightforward. Fold the edge back up, while forming a pleat. Do this by pushing in the diagonal creases indicated on the left and right to make the paper pop up, thus going along the mountain fold and 2 valley folds indicated in the step. I hope you get time to fold the yellow bird. My friends and myself graduated with Computer Science degrees, so we're nerds and understand this is a Chocobo. 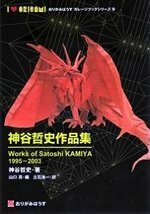 I was wondering where i could buy a book of Satoshi Kamiya's online that includes diagrams of his very complex models. I am strongly inspired by his work and am wishing to enhance my origami skills! There are multiple sites you can order it from. Here are some. Origami Shop ( http://www.origami-s...)- ships all over the world, probably one of the best web sites for ordering stuff like this. The book pretty much costs $75 everywhere, but the shipping depends on how close to France you are. Very good site. They have a very nice service. There is Origami USA (http://www.origamius...)- definitely not the best web site, and not a very good website for paper either, I would probably use this only as a "backup" site. These are the ones I know about. There probably are more sites, so if you are not satisfied you could search more. Hello, could I please get help on steps 45-51 of mammuthus primigenius (I do have the book). I love the look of Satoshi's tree frog, but can't seem to get steps 56 - 62 right, or 82 - 87. Does anyone have a short video tutorial showing these steps?